A first batch of Egyptian humanitarian aid to Yemen has been dispatched on Thursday, a statement by Egypt's Foreign Ministry said. "The shipment, which consists of 10 tonnes of medicines, vaccines and medical material will arrive in Yemen on 6 and 9 April", the statement said. The move reflects Egypt's firm support to the brotherly Yemeni people in their plight, the statement added. 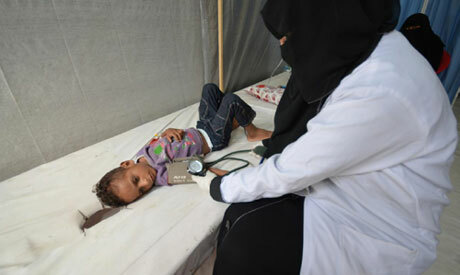 Egypt has been regularly sending food and medical aid to Yemen during its three-year-old civil war. In early April 2018, United Nations Secretary-General António Guterres reported that the Yemen crisis had become the world’s worst humanitarian crisis. Approximately three quarters (equivalent to over 22 million) of Yemen’s population were in dire need of humanitarian assistance and protection.